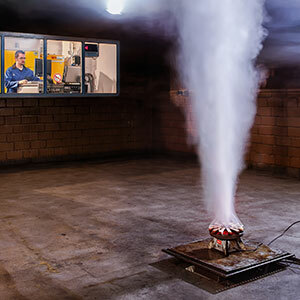 VdS has a number of well-equipped laboratories in which type and system tests can be conducted on products for fire and intruder protection. A fundamental requirement for this – apart from using state-of-the-art technologies and innovative testing procedures – is that the staff have a sound knowledge base and long-time experience. VdS supports manufacturers right the way through from the original product development and prototype testing to the VdS-approved end product. Because the entire value chain is covered, manufacturers enjoy considerable competitive advantage by, for example, significantly reducing the time it takes to bring their products to market. Fast, uncomplicated testing procedures help with CE labeling and VdS approval. With their many years of experience, the engineers can be called on in a consulting capacity when selecting and applying the relevant standards and guidelines. The VdS laboratories are accredited by Deutsche Akkreditierungsstelle GmbH (DAkkS). Fire detection and alarm systems as well as extinguishing systems make a valuable contribution to protecting people and property. VdS operates laboratories where all components are being tested in line with national, international and VdS guidelines to ensure proper functioning. In our VdS laboratories for electronic security devices and systems and mechanical security devices, we test products for their intrusion resistance and, if necessary, theft attempts. VdS approval for electronic and mechanical security technology certifies sophisticated and functionally reliable technology.